History is known to repeat itself. So, when angling legend Al Lindner plays historian, pay attention and you’ll repeat his success. Today’s lesson: walleyes have and always will aggressively attack hair baits like the new VMC® Bucktail Jig. VMC’s new Bucktail Jig is the bait with which Lindner’s been loading his boat with aggressive walleyes. He collaborated on its design with VMC, a Respected Rapala® Brand, after inspiration hit while fishing a classic Rapala bait with great success. 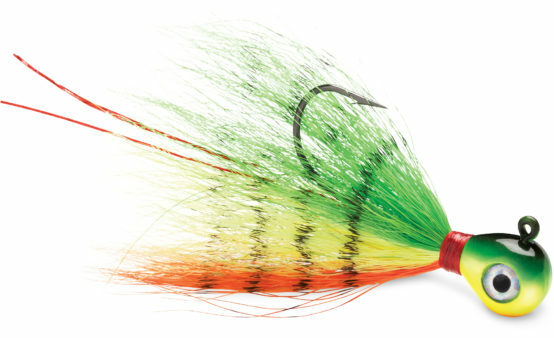 The Bucktail Jig’s head design provides added control and balance for a variety of jigging techniques. Highly versatile, it can be fished alone or dressed with a soft-plastic trailer or live bait. It’s armed with a premium high-carbon steel, chemically sharpened needlepoint VMC hook. Bucktail hair maintains its shape in water, presenting gamefish a larger target to attack. Tinsel fibers complement Bucktail Jigs’ skirts to enhance visual appeal. They are available in eight color patterns: Black, Chartreuse White, Fathead, Green Fire UV, Orange Fire UV, Firetiger, Pink Fire UV and White. “The color mix for walleyes is perfect,” Lindner says. The VMC Bucktail Jig comes two per pack in three sizes: 1/8 ounce (1/0 hook), 1/4 ounce (2/0 hook) and 3/8 ounce (2/0 hook). While many walleye anglers may have forgotten the appeal of bucktail jigs, walleyes did not. “We just filmed a show fishing VMC Bucktails and really smoked ‘em,” Lindner says. Learning successful tactics from the past, enhanced by VMC’s modern engineering, will help generations of future anglers repeat Lindner’s success. This entry was posted in Pro Staff, VMC. Bookmark the permalink.